Wouldn't it be great if there was an add-on that could make light work of your busy social networking lifestyle? Social Networking is a great way to build a community and promote your business. 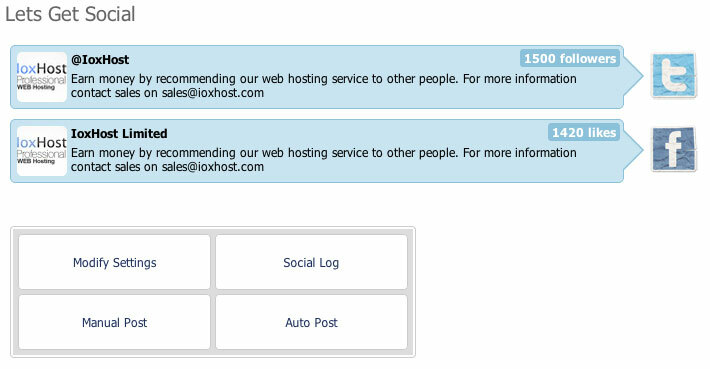 The WHMCSnow addon - 'Lets Get Social' integrates Facebook and Twitter seamlessly to allow you to automatically send pre-defined posts to the social networks as well as posting directly from your admin area. 'Lets Get Social' will turn your likes and follows into customer engagement and increased sales. After the first year, support & updates access can be optionally renewed to maintain access at a cost of just £5.49 per year.